This Modern Halo Tanzanite Diamond Ring in 14K White Gold gets its contemporary appeal from its stunning center stone and subtle style updates. 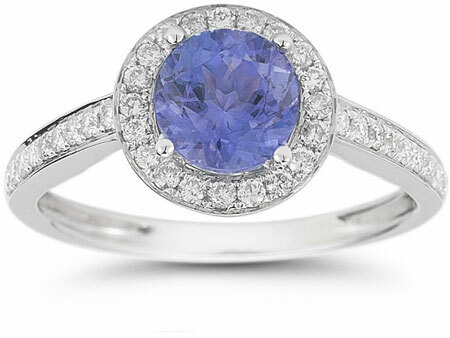 The intriguing gemstone that captures eyes and imaginations from the center of this updated halo ring is a stunning 6mm round tanzanite, a unique gemstone with a purplish-blue hue that's unlike that of any other stone. Calling to mind the petals of a cornflower, this gem's mesmerizing color makes it hard to pull your eyes away. Discovered in Tanzania in the 1970s, tanzanite has been found in just one small five-square-mile area on the entire globe, giving it a sense of exclusivity, along with exotic beauty. Accompanying this alluring modern gemstone are 0.35 carats of diamonds, for a total of 38 sparkling small round stones that work together to contribute to this style's updated appeal. Each of these dazzling little gems is channel set into a foundation of 14K white gold, giving this ring a streamlined look that brings its design squarely into the present. 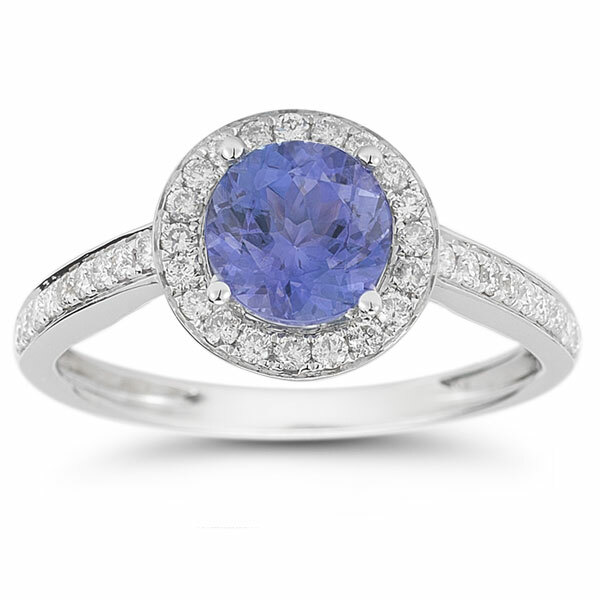 Nine of these diamonds glitter upward from either side of the smooth, polished band, while 20 of them glimmer as they form a frame around the tanzanite and emphasize this gem's stunning color. We guarantee our Modern Halo Tanzanite Diamond Ring in 14K White Gold to be high quality, authentic jewelry, as described above.